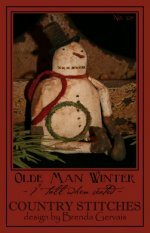 NEW for Christmas 2010! 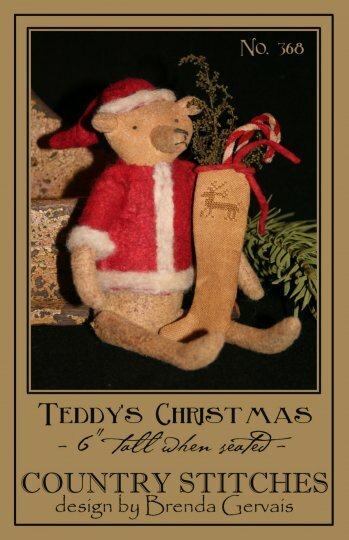 Pattern includes instructions for 3 wonderful holiday designs...11 1/2" St. Nick & Parson Brown doll piece that is nestled upon a paper mache box. Vintage sisal trees & wreath adds extra detail and charm. Old sheet music scallop finishes off this piece nicely. For a fun & quick project, is the 11" x 14" quick sew appliqued picture. Various cross stitch motifs and sheet music adds texture and appeal to this picture. Lastly, is the 5 1/2" punch needle tree ornament. This piece was inspired by the old bulbs that tapered to a point on the bottom...just like the ones that hung on my Grammie's tree. Wool holly leaves & rusty jingle bell and hanger brings an extra special touch to this ornament. Another 3 for 2 pattern! Pattern includes instructions for an 8" x 6" quick sew appliqued penny rug, quick sew appliqued framed picture and a sweet little 6 1/2" punch needle mitten. Did I mention sheet music? I love old sheet music, any old papers at all really...so I've added paper to these for added detail and charm. 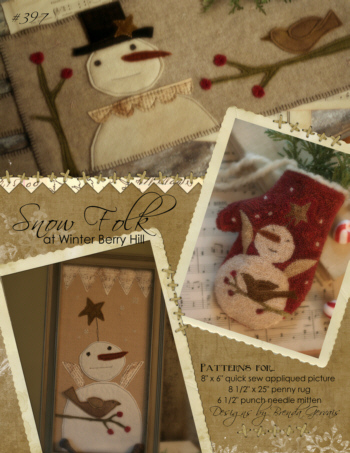 These items are all quick sew projects and will warm your heart & home all winter long! 3 patterns for the price of 2! 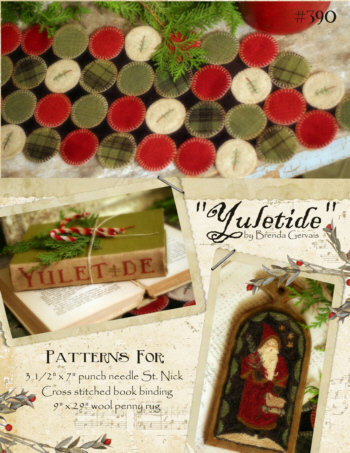 Pattern includes instructions for the wool penny rug with embroidered christmas tree motifs, St. Nick punch needle hornbook and a cross stitched book binding. NEW Santa for 2009! 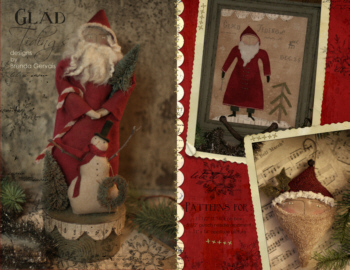 Pattern for a 20" woodsy santa that is constructed from cloth & paper clay. Easy to follow instructions with photos walk you through the process of making this wonderful guys face...it is much easier then you may think! Gently tucked in santa's arms is Rudolph the red-nosed reindeer. Real spruce pine and vintage chenille candycanes adds additional charm to this piece. 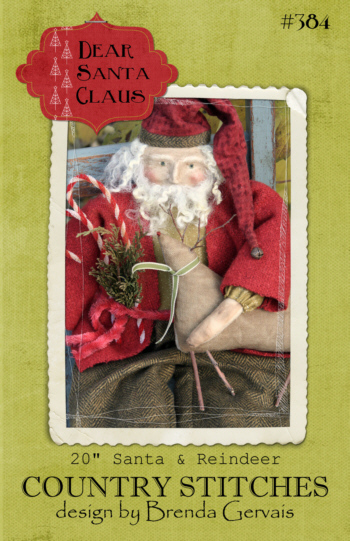 Check out our supplies category for the Paper Clay & chenille candycane pipecleaners needed for this pattern. NEW for Christmas 2009 ! 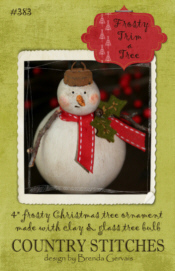 Sweet little 4" Christmas tree ornament is constructed from a glass tree bulb and Paper Clay. Easy to follow instructions along with photos walks you through the simple steps of forming snowman's head from clay...so simple & fun! Wooly holly leaves and rusty jingle bell adds charm to this piece. We sell the clear Christmas tree bulbs for this pattern...see them under the supplies category. NEW for Christmas 2009! 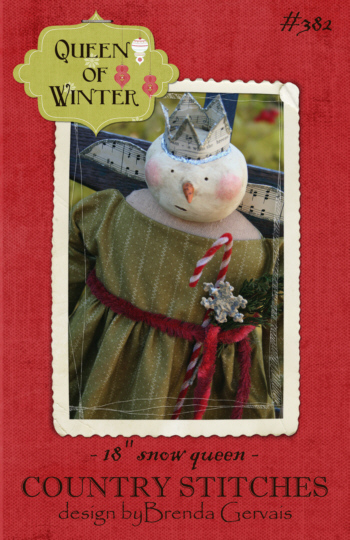 Queen of Winter is just as sweet as can be...from the tip of her music paper tiara to the tips of her little black boots! Vintage chenille candycane, glittery snowflake and fresh spruce pine make her so very special. 18" doll is constructed from cloth & paperclay. Pattern includes lots of photos and easy to follow instructions for forming the clay head...much easier then you may think! Check out the supplies category for glitter glue, rusty tin snowflakes, PaperClay and candycane pipecleaners...all needed to complete this special snow lady. 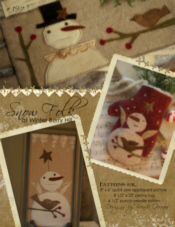 Pattern for an 18" quick & easy snowman. A simple one piece body makes for simple construction. Parson is sporting his favorite brown wool top hat & old brown winter skates. A sparse bundle of dried Sweet Annie and a vintage candy cane are tucked under his arm for added charm. Be sure to check out our CALICO category for the great green wooly flannel used for Parson's scarf! Vintage candycane pipecleaners and Sweet Annie can be found under the SUPPLIES category. Introducing our 2008 St. Nick pattern! 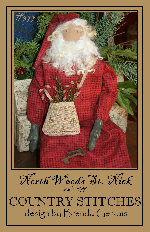 Instructions for a 22" St. Nick that is dressed in a wooly flannel robe. 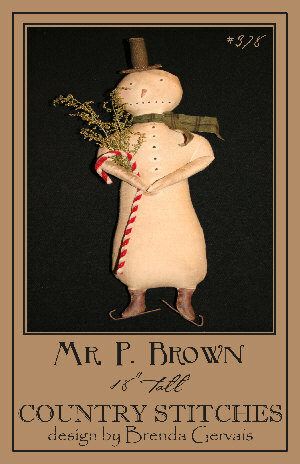 The pocket is stitched on 25 count Dublin Flax linen with little pine trees & reindeer motifs. The pocket is then backed in civil war reproduction calico. 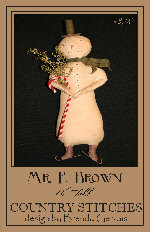 Dried Sweet Annie and vintage candy cane pipecleaners are tucked into the pocket for added detail and charm.